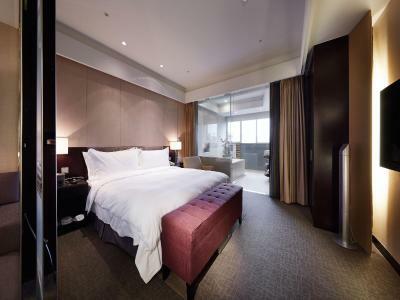 Lock in a great price for The Tango Hotel Taipei XinYi – rated 8.4 by recent guests! Location was wonderful, the setup and size of the room was excellent, very comfortable. The included breakfast is very nice. There is a great mix of fresh veggies, fruit, local cuisine and western food choices. Pretty much everyone can pick what they like. The coffee is good too. We had a room with a jacuzzi tub, and that was very nice as well. Big, spacious room, clean room with excellent bathroom and amenities. Breakfast is so good, I've been to many hotels and breakfast served at Tango is one of the top on my list, comparable to those at 5 star hotel. Short walk to Breeze shopping malls with many luxury brands. Short walk to YongChun station the blue line where it will get to to basically everywhere in Taipei. 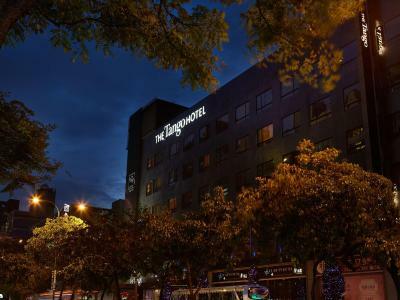 Convenient location right next to Starbucks and pharmacies to if you get a bit of a runny nose during this rainy season it won't stop you from exploring the City. We liked being able to sit in the downstairs lounge at any time and make an espresso and enjoy some complimentary food, and the pineapple cake provided free. The room was very spacious and quiet. 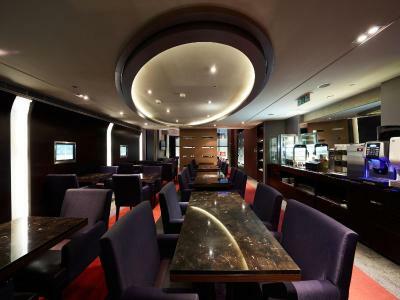 We could walk everywhere in the beautiful shopping and restaurant area of xinyi and very close to the metro for accessing other areas. Staff were very helpful. I have been staying there twice for few weeks each time, during business trips. I like the place for the location, the cleanness and the courtesy of the staff. I found all the staff extremely professional and helpful. The level of attention to the satisfaction of the guest is comparable to a 5 stars hotel in Europe. 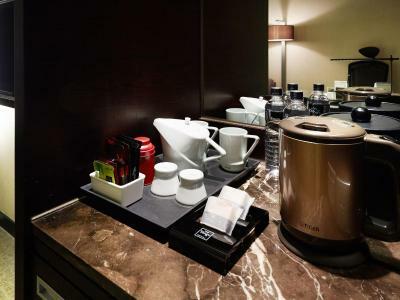 There is an all-day business center offering tea, coffee and snacks. 24h restaurants at few hundred meters. Very useful for people with jet-leg. I will be back there for sure next time I am going to Taipei. The room was very spacious with a very large tub. While the breakfast buffet did not serve typical western food (bacon, eggs, waffles, hash browns, etc. ), it was, for me, a very pleasant and enjoyable surprise. Of the 4 hotels we stayed in while in Taiwan, The Tango had one of the best breakfast buffet. 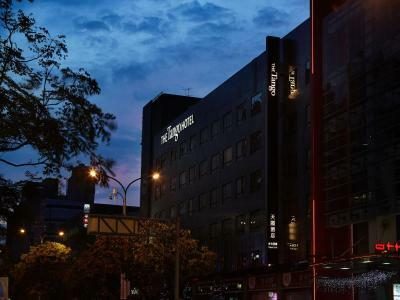 The room was very large and quiet and the hotel is located very close to the subway station and is also within walking distance to Taipei 101. Walking distance to most attractions! Super breakfast! Essentially for Chinese! Improvement for continental breakfast is a plus! Smooth and quick check in. Friendly and helpful staff. 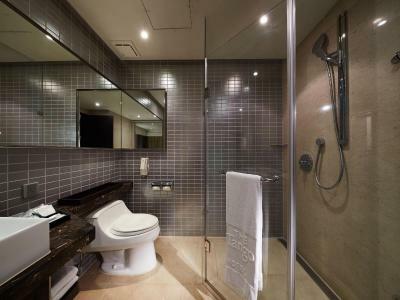 Very nice and large bathroom, about 1/3rd of the room size. Free minibar and pineapple cake. Super comfortable bed. 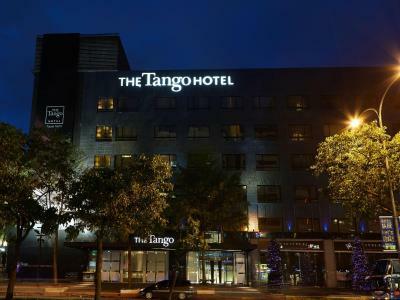 The Tango Hotel Taipei XinYi This rating is a reflection of how the property compares to the industry standard when it comes to price, facilities and services available. It's based on a self-evaluation by the property. Use this rating to help choose your stay! One of our top picks in Taipei.A 4-minute walk from City Hall MRT Station, this stylish property in Taipei has free wired internet and Wi-Fi. 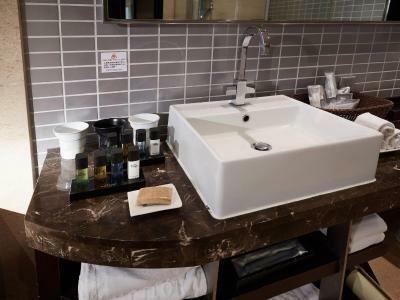 In addition to a fitness center, it features a professional business center and rooms with a spa bathtub. The famous Taipei 101 is about a 15-minute walk from the property. Spacious and air-conditioned, the rooms are well-furnished with a large flat-screen TV and DVD player. 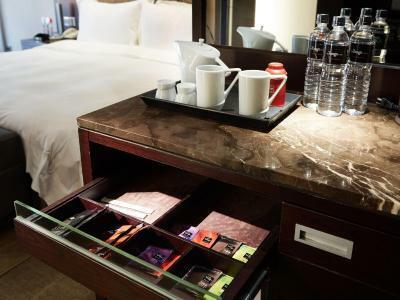 A minibar, ironing facilities and personal safe are included. Some rooms even have a washing machine. 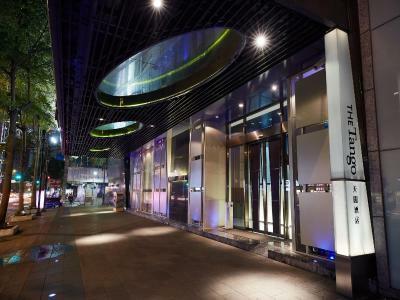 The Tango Hotel XinYi is a 10-minute drive from Raohe Night Market and XinYi Business District. It is a 20-minute drive from Songshan Airport and WuFenPu Commercial Zone. Taoyuan Airport is a 50-minute drive away. The 24-hour front desk provides daily newspapers. Dry cleaning and ironing services are also available. A daily buffet breakfast can be enjoyed at the chic lounge. 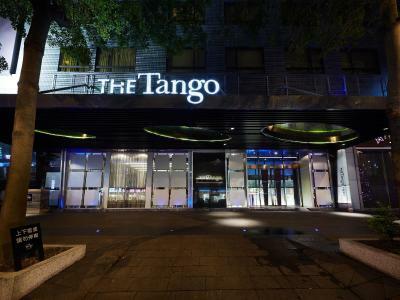 When would you like to stay at The Tango Hotel Taipei XinYi? 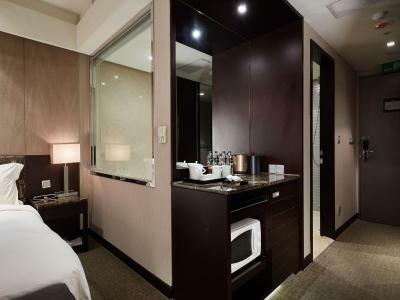 Spacious and modern room features a flat-screen TV, DVD player and bathroom with a spa bathtub. This spacious suite features a separate living area, a spacious work space and a flat-screen TV. The large bathroom has a spa tub which can fit 2 people. 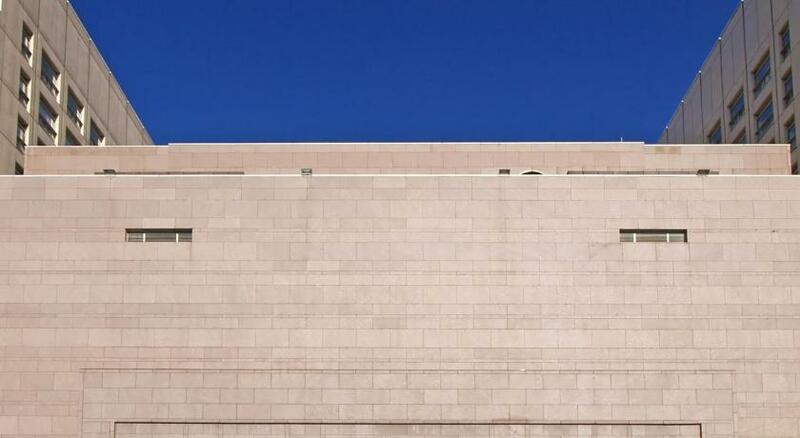 This suite does not have windows. 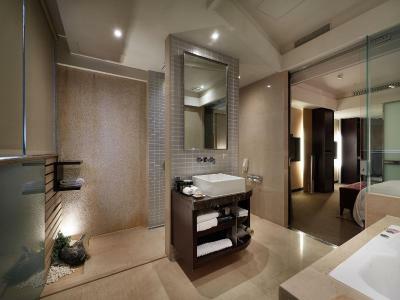 Modern room features a flat-screen TV, DVD player and bathroom with a spa bathtub. This room type does not have windows. Spacious suite features a separate living area, ample work space and 2 flat-screen TVs. 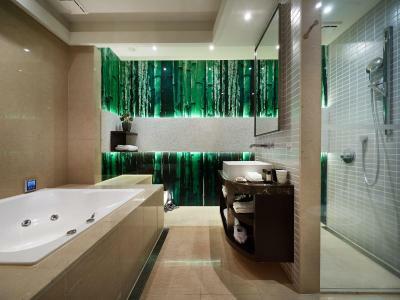 Large bathroom has a spa tub which can fit 2 people. Spacious suite features a separate living area, spacious work space and a flat-screen TV. Large bathroom has a spa tub which can fit 2 people. Some of the suites have a washing machine. 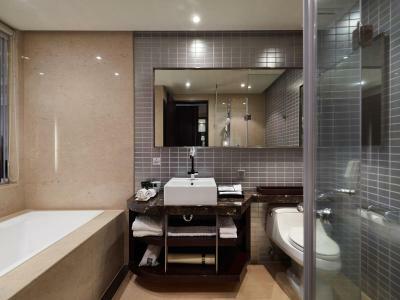 Spacious suite features European furniture and a large private bathroom with Kohler and Hansgrohe bathroom fittings. Suite comes with free Wi-Fi access and complimentary snacks/beverages throughout the day. This triple room features a sofa, satellite TV and mini-bar. Please note the size of extra bed is 51 in x 77 in x 12 in. 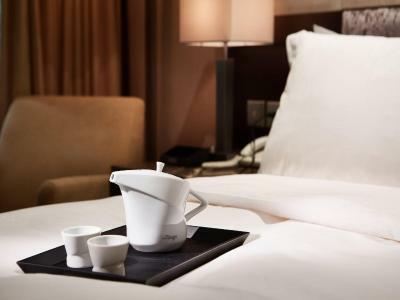 House Rules The Tango Hotel Taipei XinYi takes special requests – add in the next step! 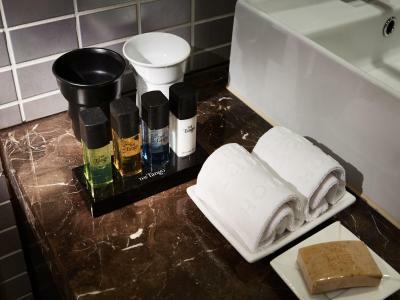 The Tango Hotel Taipei XinYi accepts these cards and reserves the right to temporarily hold an amount prior to arrival. The property offers a limited number of cots. Please reserve in advance. Room is too dark, insufficient lighting makes it feels very enclosed and suffocated even though the junior suite I had is spacious. Even the breakfast dining area is extremely dark, not cheery at all to start the day. I like the toaster/microwave and hot/cold water availability at all times near the lift lobby. 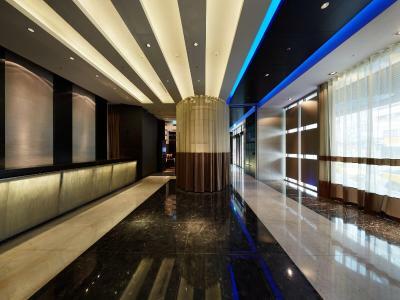 Location is very good, less than 10 minutes walk to Yongchun MRT and from there only 3 stations away to Nangang HSR. A-mart just next door and many local food places. There could have been fried and boiled potato. a little more western style food. 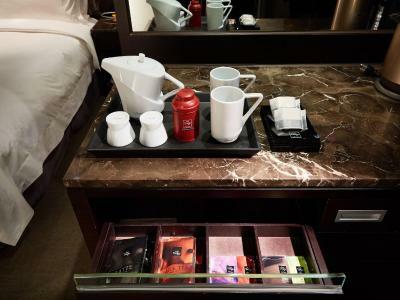 The mini bar could have more coke and a variety of snacks like potato chips, crackers. The scrambled eggs were just right. The bacon wrapped around another meat made it fresh and moist. The fruit choices was good. There was construction going on next to the hotel which wasn’t highlighted when the booing was made! It’s lound pounding from 9am. Illumination in the room was poor. The noise level from the road even though the windows are shut tight. The convenience of the mobile phone device provided for each room has been a bonus for us with big family taking up 3 rooms. Allowing us to communicate with no additional cost incurred. Check-in time is 3pm and we reached at 1:30pm after a long journey. We asked the hotel staff if we could do early check-in . Staff said you can but you need to pay extra for 1.5hrs. It is a decent property. Room was clean. Decent stay. Staff was not attentive at front desk; the room was a bit cold with a draft and the heater didn't work. Parking could be made a bit better, but being at prime location that could be difficult we understand. the space of breakfast area was too cramped and options were little. I like the hospitality of the staff and understandable room rates. Great ambiance and most of all easy access to transportation. We had a delux King room. 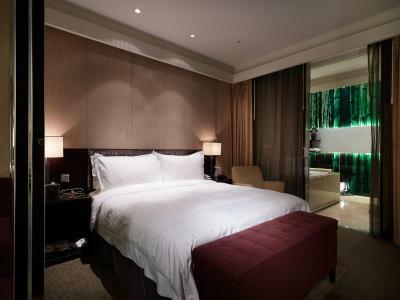 It is really meant for just one person, and for a relatively short stay. There weren't enough hangers in the closet, and there was certainly not enough drawer space. The bathroom was very nice, but VERY poorly lit. This was a comment made in other reviews, and it is very true. Literally, there is not enough light to do makeup, or shave. Quality and choice of breakfast could be better.